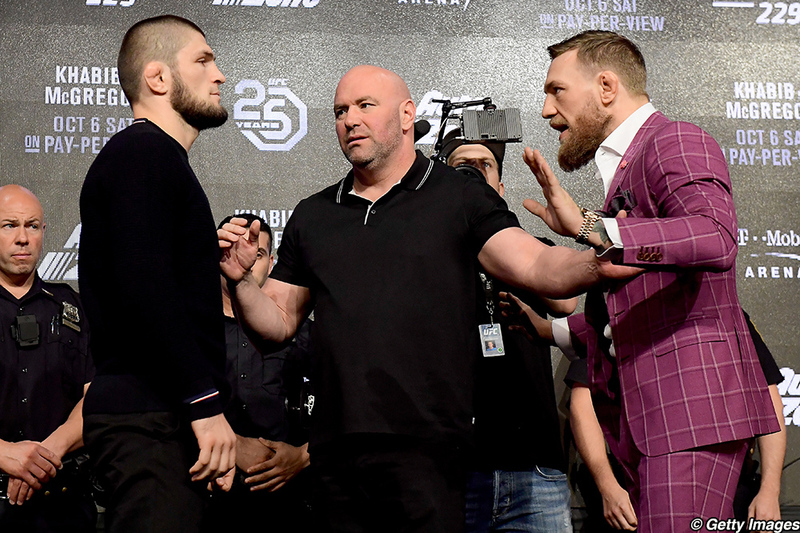 Both fighters walked into the Radio City Music Hall in New York for the highly anticipated UFC 229 Khabib vs. McGregor press conference. We got to see the reigning UFC Lightweight Champion Khabib Nurmagmedov share a stage with the former two division champ Conor McGregor. McGregor took the stage first, sporting his two stripped belts and waited for the Eagle. McGregor also brought Proper Twelve to the presser. Proper Twelve is Conor McGregor’s first venture in the whiskey game. Proper Twelve, honestly, stole the show. Nurmagmedov followed shortly after. The undefeated Lightweight UFC Champion came only with his belt. No promotional items. Just the same old Russian icy stare he gives all of his opponents. For the opening minutes, McGregor was basically just selling his new whiskey. He even got his boss/business partner Dana White to take a sip on stage with him. A win for Proper Twelve. We later found out that Proper Twelve will also be in the ring during the fight. It will be on the UFC Octagon canvas on October 6th for Khabib vs. McGregor. No matter what, Proper Twelve will leave New York a winner. Usually, McGregor rules the mic and the opponent starts to change their behavior. But that didn’t happen this time. Nurmagmedov looked completely unphased by Conor’s comments. At many points during the press conference, McGregor tried to pluck the feathers of The Eagle. 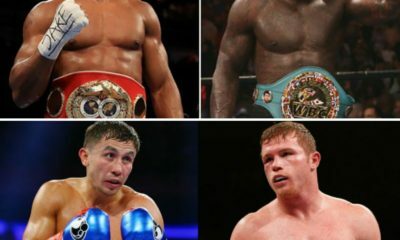 Conor played the same cards he did on social media. He talked about Khabib’s fighting style, family, country and called him a rat and a weasel, the classic McGregor lines. 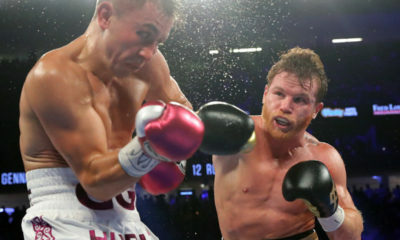 Some would say, me included, McGregor looked a little off and his one-liners weren’t hitting home. It could be that there were no fans. McGregor even commented on the fan-less environment. It could be that because Khabib wasn’t giving him the response he was looking for. Maybe it was the Proper Twelve, but the smooth trash talker looked more Colby Covington than Chael P. Sonnen. His usual hit-or-miss lines looked to miss more than hit. 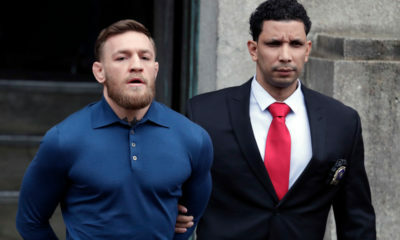 Something definitely seemed off with Conor today. Khabib, on the other hand, was…well, Khabib. Khabib, at one point, even told Conor to sit and that he looked like a clown. The only real reaction from Khabib came after a media member said, “Asa lama lakum…” and followed it up by congratulating McGregor on his whiskey venture. Khabib told him he can’t be a Muslim and drink alcohol. Conor even tried to tempt Khabib with a sip of Proper Twelve, but Khabib declined the offer. The whole presser conference looked as if Conor was an annoying fly that Khabib just couldn’t swat away. It kind resembled Ronda Rousey vs. Holly Holm to some extent. Ronda wanted to keep testing Holly’s patience until she got the reaction she wanted. But we all know that reaction never came. We have even seen the same play out with Joanna Jedrzejczyk and Rose Namajunas. And when Conor couldn’t get Khabib to react from personal attacks, Conor changed his aim to Khabib’s manager, Ali Abdelaziz. “Who’s Noah? !” yelled McGregor toward Abdelaziz. Noah is Abdelaziz’s son, who Abdelaziz reportedly owed child support payments towards. The presser, for the most part, played out how most believed it would. Conor controlling the mic, Dana White smiling at Conor and Khabib with his glare most of the time. The only odd thing was the belts. Not Conor obviously not sneaking mini bottles in his jacket, but the two stripped belts. Did the UFC and Dana White know Conor would walk out with the two belts? Did the UFC let McGregor do this? 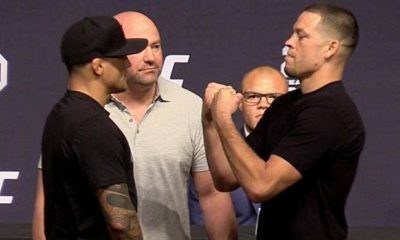 Pingback: What Will the UFC do with UFC 230?